Customers can be fooled by many ways when it comes to a cyber crime. In the past there have been instances where apps lured customers into giving their financial details. Others send you fake emails and message. Some rob you of your money from even ATMs. Meanwhile, some try to connect with your via websites where chatting portals are given by majority of banks. The largest lender State Bank of India (SBI) is keen on making its customer aware over such illegal acts. The bank has been on occasional basis alerting its customers to be aware of a host of fake apps, ATM fraud and fake websites. Now in a latest development, SBI has warned its customers over chatting on social media fake bank account. SBI has been taking steps in overcoming such situations, considering the bank’s customers were recently trapped in fake bank apps. Now the lender believes of warning its customers over fake social media account. SBI also revealed the signs in which a customer can differentiate between fake and real social media account. 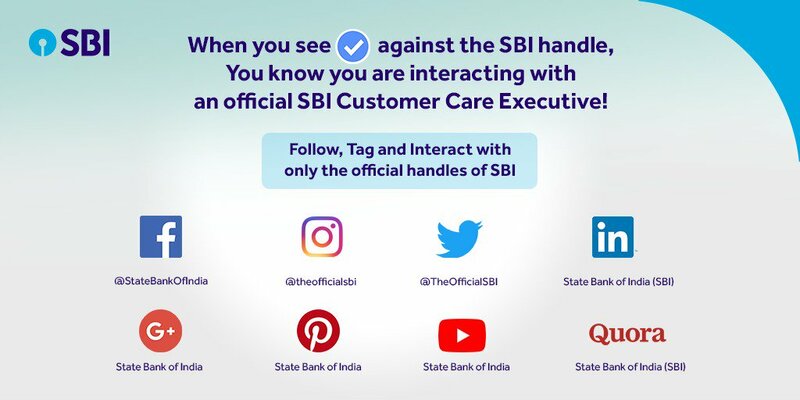 At SBI, these are the real social media account. Making a fake social media account has increasingly become very common. Hence, it becomes very important for a customer to spot a fake social media account when carrying a financial queries. Here are some of the way to spot the fake ones.